Up, up and away! Flight in virtual reality is here! Along with Eye Control, the Smalt, Facebook News Feed updates and (hilarious) AI generated craft beer names like Heart Compost and Black Sink Stout. The Weekly Wins are full of futuristic advancements this week. First we take a look at the Birdly Simulator, a full body experience that brings flight to virtual reality. Then we check out Microsoft’s Eye Control announcement for Windows and the Smalt, the world’s first smart salt shaker. Plus, Facebook drops some big news on how News Feed will begin to be organized, and AI works its name generating magic once again. Crack open a cold one and kick off your long weekend with the latest in the world of digital. Cheers! Fly like a bird in VR! You can now experience the miracle of flight as a bird, in virtual reality of course. 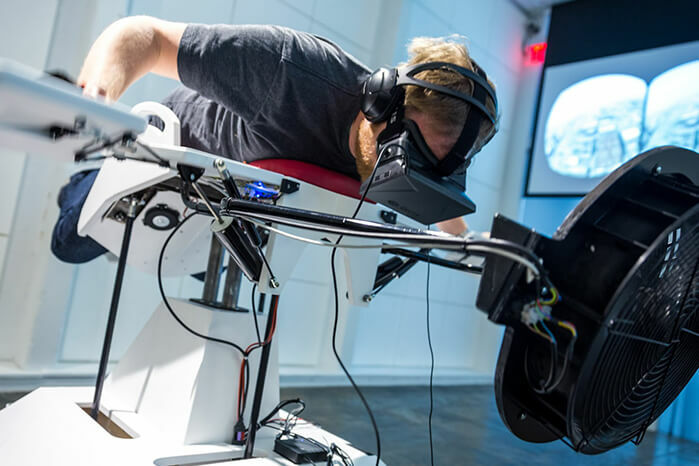 The Birdly Simulator has players lie face down on a table like structure and strap their arms to moving boards so they can flap like they have wings. The platform rises, falls, and moves side to side while a large fan sits in front of their face to create the feeling of air rushing past them. To complete the flight simulation, players wear a VR headset, allowing them to look around in all directions as they “fly” like a bird over cities like New York City and Ulm, Germany. For those who answer the question, “If you could have any super power, which would you choose?” with “flight”, this is probably the closest you’ll get to flying like a bird. Technology continues to do great things for humanity. Microsoft has added native eye tracking support into Windows 10, a feature designed primarily for helping people who are unable to use a traditional mouse or keyboard. Eye Control is now available for beta testing, and is going to change the lives of people suffering from neuro-muscular diseases like ALS. Eye Control comes with many features that allow users to interact with Windows using just their eyes. “Shape writing” allows users to easily form words and sentences by just looking at the first and last letters on a keyboard and “simply glancing at letters in between,” rather than focusing on each individual character. Kudos to Microsoft for making eye tracking technology available worldwide! It dispenses salt AND has pretty lights! In a digital world of endless possibilities, it is increasingly important to remember, “Just because you can, doesn’t mean you should.” Well, the creators behind the Smalt didn’t get the memo. 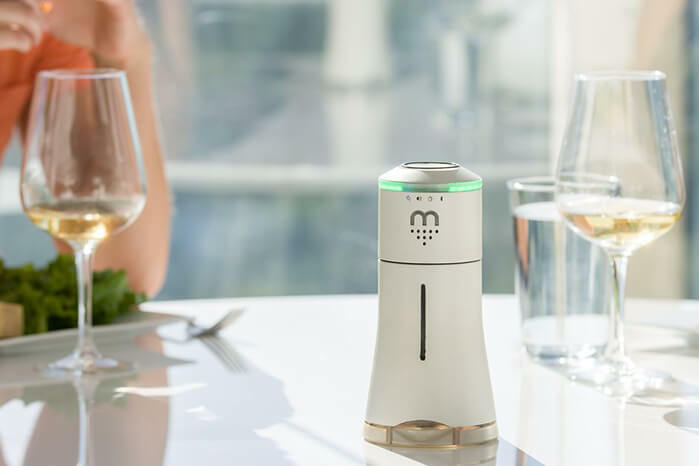 The Smalt is “the world’s first smart salt shaker.” Paired with an app and controlled by your smartphone or Amazon Echo, the Smalt can dispense different amounts of salt all by the touch of a button. You just have to set it up, sync it to your phone, unlock your phone, open the app, then find and press the correct function – because that’s so much quicker than just using a good ol’ salt shaker. Even if you’re not sold on it, the pretty LCD screen, multi coloured “mood” lights and Bluetooth speaker capabilities was enough to get about 50 backers on Indiegogo so far. Apparently they could look past the fact that it doesn’t even grind salt. You do you, Smalt. You do you. We’re living in a world of instant gratification, and the Internet is no exception. According to Facebook, when a website takes longer than 3 seconds to load, 40% of visitors abandon the page. As a result, Facebook has announced that they’ll be giving stories with web pages that load the quickest precedence over other content. This means your News Feed will soon prioritize pages that load quickly by bringing them to the top and sending slowpoke pages to the bottom. This update is Facebook’s attempt to better serve the Facebook community and although it promises a smoother and more efficient user experience, traffic to websites with slow web pages will significantly decrease. "Do you have Devil's Chard on tap?" Ah, artificial intelligence: contributing to futuristic technological advancements and providing the world with a good laugh. AI has been used multiple times to generate hilarious names. 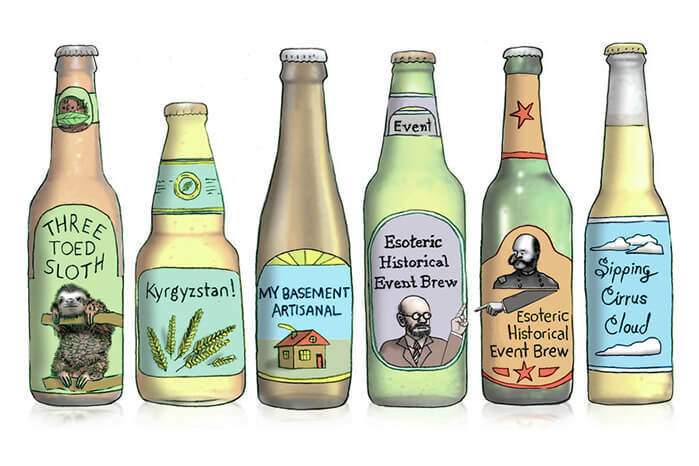 First we had paint names (like Stanky Bean), then metal band names (like Inhuman Sand), and now AI has returned to entertain us with a range of craft beer names. Scientist Janelle Shane is behind the neural-network which has generated a list of IPAs, Strong Pale Ales, Amber Ales and Stouts after gathering hundreds of thousands of existing beer names from BeerAdvocate.com. Some of the names include: Bigly Bomb Session IPA, Heaven Cat, Third Danger, I The Moon, Whata Stout and more.